The 2012 NSF Minority Faculty Development Workshop (MFDW): Engineering Enterprise and Innovation, is designed to provide participants with opportunities for professional development and the chance to gain a better understanding of research innovation and translation. The workshop is targeted towards early and mid-career engineering faculty who are members of underrepresented groups as defined by NSF (African American, Hispanic, and Native American). Recognizing that interdisciplinarity and collaboration drive innovation and that translational research that applies new discoveries to meet societal needs is paramount to maintaining global competitiveness and economic prosperity, and further that underrepresented minorities and women represent a pool of untapped entrepreneurial talent, this workshop is uniquely designed to provide professional development, education and mentoring towards career impacting innovation and entrepreneurship. Our approach to the workshop is research-based and fully integrates skills development in the areas of leadership, collaboration, management, marketing, enterprise, and the execution of translational research. The 2012 Workshop is co-located with the Academic Workshop in Computing for Underrepresented Participants. The workshop will be held at Georgia Tech at the Global Learning Center in March of 2012. Travel and lodging expenses for all selected participants will be covered by the grant. Through a series of informational and interactive sessions over a 2 ½ day period, participants from four-year universities from across the country and across engineering disciplines will become better prepared to excel in the academy, become innovative leaders and to pursue research with the potential for translation and commercialization. Incorporated with the professional development component of the workshop is a specially tailored mini-workshop on innovation, translation and entrepreneurship developed in partnership with the Wallace H. Coulter Foundation and modeled in part after their Coulter College. Continuing a tradition established in the 2010 NSF Minority Development Workshop, in 2012, the National Faculty Collaborative Poster Competition (a juried poster session) will showcase innovative research conducted by participants, provide a vehicle to identify translatable work and highlight the importance of collaborative efforts in the making of the best contributions to science and engineering and career advancement. Associate Professors, Assistant Professors and Post-Docs who are members of underrepresented groups as defined by NSF (African American, Hispanic, and Native American) are eligible to apply. Applications were due by January 1, 2012. Notifications of acceptance will be sent by January 15, 2012. 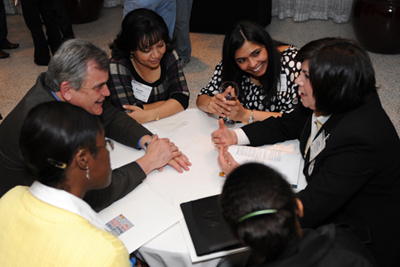 Departments are encouraged to identify and nominate underrepresented minority faculty for this unique chance to attend and benefit from the 2012 NSF Minority Faculty Development Workshop. This workshop is funded by the National Science Foundation, grant #1135303.